In a dramatic caught-on-camera crash, a driver veered off a Pomona roadway and into a parked car, the passengers of which had exited just moments before. "Why I'm here, I don't know," said survivor Daniel Archuleta. Archuleta had parked his Ford Flex outside the 4 Wheel Unlimited Auto Shop in Pomona Thursday. Moments later, he and his passengers exit. As they’re walking away, a Cadillac veers off Holt Avenue, barreling toward them at perhaps 60 miles per hour. Archuleta is just a foot from stepping in front of his Ford as the Cadillac pushes it into the wall. The close-call crash was captured by the auto shop's surveillance camera, embedded below. "Why I'm here, I don't know," said Archuleta, who suffered only minor cuts. On the passenger side, Eddie Correa saw his son knocked through the air. "As soon as I heard him accelerate, that's when I yelled," he said. Inside the auto shop, the impact knocked parts off shelves, and proprietors Dave and Tim Everman dashed out to find the Cadillac's driver unconscious. His passenger escaped injury. "There's the young lady getting out of the vehicle there," Dave Everman said. "She looked at me and said, 'I'm a prostitute." 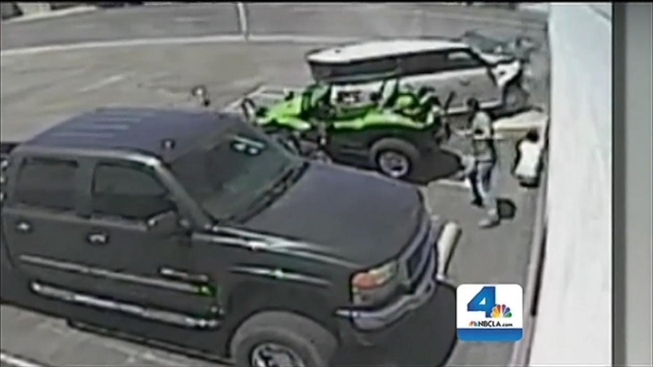 The shaken passenger went on to accuse the driver of purposefully plowing into the parking lot. "She said again and again, 'He tried to kill me, he tried to kill me – he tried to commit suicide," Everman said. The driver came to and was able to walk, but was later hospitalized with a possible underlying medical condition. Now, police are combing through the video trying to determine if this was an accident, a medical episode, or, like the passenger said, intentional. The Everman brothers are convinced that had the Ford Flex not been parked where it blunted the impact, the Cadillac would have smashed through the wall and struck those inside the shop. Whether the Cadillac driver will face charges is to be determined.